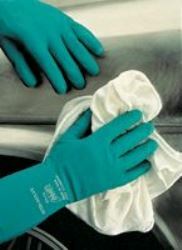 SHOWA® Size 9 Green Cotton Flock Lined 15 mil Nitrile Chemical Resistant Gloves. The pinnacle of chemical-resistance, comfort and grip, SHOWA 730 is a flock-lined, 15 mil glove designed with the full scope of performance in mind. You’re awesome! Thank you for your patience and help. Best customer service I’ve experienced in a long time!